In celebration of Jewish New Year this month, I went back to the basics to make traditional cinnamon sugar mandel bread (aka mandelbrot). Every year, I would eagerly wait for my cousin in Chicago to send them to us in the mail, reserving a whole bag just for myself! 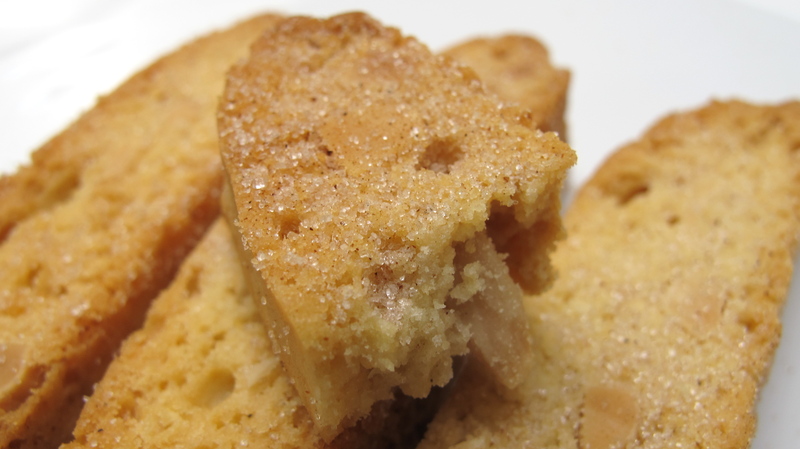 A few years later, I tried baking these cookies myself, and I realized how similar they are to an Italian biscotti in flavor, texture, and recipe. So, if you liked my previous Chocolate Dipped Almond Biscotti or Double Chocolate Pistachio Biscotti posts, this is the recipe for you! Happy New Year! Rosh Hashanah started on Wednesday evening and the celebration ends this evening. It is a time to welcome and celebrate the new year with sweets, traditionally apples dipped in honey. Round-shaped challah, symbolizing continuity, is also a staple for this holiday. A couple of hours ago I finally baked some apple-honey challah with dried cranberries! The Old City of Jerusalem is a labyrinth of narrow streets contained in a walled fortress, with access by one of seven gates: the Golden (or Lion) gate, Herod’s Gate, the Damascus Gate, the New Gate, the Jaffa Gate, the Zion Gate, and the Dung Gate. Inside the walls is the Temple Mount with the Dome of the Rock and the Western Wall. The city has four neighborhoods: the Muslim Quarter, the Christian Quarter, the Armenian Quarter, and the Jewish Quarter. Vendors, elbow to elbow in the narrow corridors of the souk, vie for buyers. Christian pilgrims walk the Via Dolorosa and visit churches commemorating the life of Jesus. Children go to school. People live here, as evidenced by the water tanks, satellite dishes, and hanging laundry in the rooftop view above. It is a busy and vibrant place. Chag Semach! It’s Purim or what I think of as the Jewish Halloween. When my husband asked me what the story was, I will confess that I had to go look it up. I could only remember a few key words… Queen Esther, Hayman, gallows, the annihilation of the Jews (again) and a three pointed hat. Click here for a better explanation. The upshot of it is that we spent Saturday making Hamantaschen, the traditional Purim cookie. I used the recipe posted on one of my favorite Jewish websites, Kveller.com. No photos as I made it but I did get one of the finished product. We made strawberry, apricot and (untraditional) chocolate. I wanted to make the poppy (mohn) filling but it was too complicated. Maybe next year. Lox are thin slices of cured salmon which are usually paired with a bagel, cream cheese and capers and is an iconic Jewish-American dish. Originating in Poland in the 17th century, Jewish families ate bagels at the end of the Sabbath on Saturday evenings. Bagels symbolize the circle of life with Lox symbolizing the saltiness of tears. The Mid-1800’s the transcontinental railroad shipped salted salmon to the East coast and saw Lox become a popular sandwich filling. Celebrate this day by partaking in a great Jewish-American tradition. Enjoy a tasty bagel topped with cream cheese, lox, red onion, and capers with maybe a tomato or two! Bagels are one of the few breads that are boiled then baked. creating the sought inside while retaining a crisp exterior. Originally bagels were baked and sold by street vendors. They would have been carried around on a long string draped over the sellers’ shoulders.